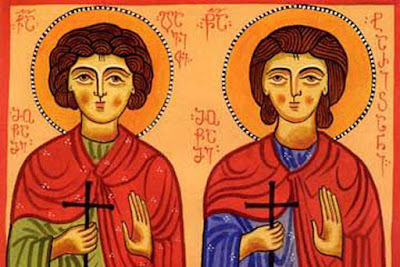 The holy martyrs David and Tarichan were born to Vardan and Tagine, pious Christians and relatives of the king. Vardan died while his sons were still young, and Tagine’s pagan brother Theodosius seized all the family’s possessions. From his spies Theodosius learned that the brothers were now herding sheep at the top of a mountain, and he ordered an ambush. But the brothers heard the noise and saw the armed soldiers before they attacked. 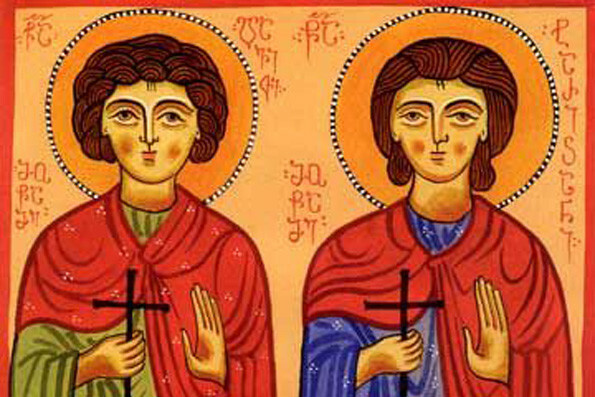 David rejoiced upon seeing his uncle and ran toward him, but Theodosius stabbed him before he could embrace him. The holy martyr released his staff from his hand, and when it fell to the ground it was miraculously transformed into a large tree. Two hundred years later a group of Christians chopped the tree down and divided the holy wood among themselves. 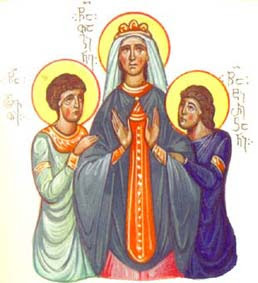 Then she took a piece of the earth that had been stained by her son David’s blood and anointed her brother’s eyes. Immediately his sight was restored. Theodosius repented before the catholicos himself. He was baptized into the Christian faith and erected a church in honor of his nephew Saint David. The mayor of Divri took Saint Tarichan’s holy relics and built a church over them in his name. Blessed Tagine began a new life in the village of Tadzarani and later reposed there. From The Lives of the Georgian Saints.